Dental implants at Bright Smile Dental Coogee will offer you these advantages and more. They can boost your self-confidence and help you be able to speak, eat and live as you want to without having to consider your teeth outside of your usual oral hygiene habits. They’re appropriate for replacing single teeth, multiple teeth or all teeth. 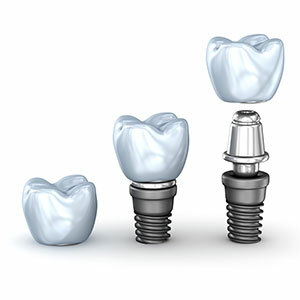 Dental implants can have a denture, bridge or crown affixed to them, depending on your needs. To restore your smile’s stability and function, we’ll begin by placing a strong titanium implant in the jaw bone. Then, your chosen restoration (crown, bridge or denture) can be placed on the implant for an aesthetically pleasing result. When you take care of your implant like you do your regular teeth with brushing and flossing each day and biyearly dental checkups, it can last a lifetime! Some restorative dental solutions are removable and require more maintenance than dental implants. Additionally, they look more natural than these options and feel as secure and look as natural as a normal tooth. By getting a dental implant, your jaw’s bone mass is preserved, preventing future tooth loss. Are you ready to get started on creating the smile of your dreams? Contact us today to schedule a complimentary consultation for dental implants in Coogee!